In a Fortune interview, noted climatologist John Christy contends the green crusade to fight climate change is "all cost and no benefit." John Christy says that global warming has been overestimated. NEW YORK (Fortune) -- With Congress about to take up sweeping climate-change legislation, expect to hear more in coming weeks from John Christy, director of the Earth System Science Center at University of Alabama-Huntsville. 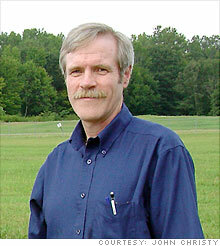 A veteran climatologist who refuses to accept any research funding from the oil or auto industries, Christy was a lead author of the 2001 Intergovernmental Panel on Climate Change report as well as one of the three authors of the American Geophysical Union's landmark 2003 statement on climate change. Yet despite those green-sounding credentials, Christy is not calling for draconian cuts in carbon emissions. Quite the contrary. Christy is actually the environmental lobby's worst nightmare - an accomplished climate scientist with no ties to Big Oil who has produced reams and reams of data that undermine arguments that the earth's atmosphere is warming at an unusual rate and question whether the remedies being talked about in Congress will actually do any good. Christy's critics in the blogosphere assume his research is funded by the oil industry. But Christy has testified in federal court that his research is funded by the National Oceanic & Atmospheric Administration and that the only money he has ever received from corporate interests - $2,000 from the Competitive Enterprise Institute for penning a chapter of a global warming book in 2002 - he gave away to a charity, the Christian Women's Job Corps. His most controversial argument is that the surface temperature readings upon which global warming theory is built have been distorted by urbanization. Due to the solar heat captured by bricks and pavement and due to the changing wind patterns caused by large buildings, a weather station placed in a rural village in 1900 will inevitably show higher temperature readings if that village has, over time, been transformed into small city or a suburban shopping district, Christy says. The only way to control for such surface distortions is by measuring atmospheric temperatures. And when Christy and his co-researcher Roy Spencer, a former NASA scientist now teaching at UA-Huntsville, began analyzing temperature readings from NOAA and NASA satellites, they found much slighter increases in atmospheric temperatures than what was being recorded on the surface. Christy and Spencer also found that nearly all the increases in average surface temperatures are related to nighttime readings - which makes sense if bricks and pavement are in fact retaining heat that would otherwise be dispersed. In testimony to the House Ways and Means Committee in February, Christy displayed a chart showing central California temperature trends for both the developed San Joaquin Valley and the largely undeveloped Sierra foothills. "The daytime temperatures of both regions show virtually no change over the past 100 years, while the nighttime temperatures indicate the developed Valley has warmed significantly while the undeveloped Sierra foothills have not," Christy told the committee. I recently spoke with Christy about his controversial research. Why did you help write the 2001 IPCC report and the 2003 AGU statement on climate change if you disagreed with their fundamental conclusions? With the 2001 IPCC report, the material in there over which I had control was satisfactory to me. I wouldn't say I agreed with other parts. As far as the AGU, I thought that was a fine statement because it did not put forth a magnitude of the warming. We just said that human effects have a warming influence, and that's certainly true. There was nothing about disaster or catastrophe. In fact, I was very upset about the latest AGU statement [in 2007]. It was about alarmist as you can get. When you testified before Ways and Means, did you have any sense that committee members on either side were open to having their minds changed? Or are views set in stone at this point? Generally people believe what they want to believe, so their minds will not change. However, as the issue is exposed in terms of economics and cost benefit - in my view, it's all cost and no benefit - I think some of the people will take one step backward and say, Let me investigate the science a little more closely. In laymen's terms, what's wrong with the surface temperature readings that are widely used to make the case for global warming? First is the placement of the temperature stations. They're placed in convenient locations that might be in a parking lot or near a house and thus get extra heating from these human structures. Over time, there's been the development of areas into farms or buildings or parking lots. Also, a number of these weather stations have become electronic, and many of them were moved to a place where there is electricity, which is usually right outside a building. As a result, there's a natural warming tendency, especially in the nighttime temperatures, that has been misinterpreted as greenhouse warming. Are there any negative consequences to this localized warming? It's a small impact, but there is an indication that major thunderstorms are more likely to form downwind of major cities like St. Louis and Atlanta. The extra heating of the city causes the air to rise with a little more punch. Have you been able to confirm your satellite temperature readings by other means? Weather balloons. We take satellite shots at the same place where the balloon is released so we're looking at the same column of air. Our satellite data compares exceptionally well to the balloon data. During your House Ways and Means testimony, you showed a chart juxtaposing predictions made by NASA's Jim Hansen in 1988 for future temperature increases against the actual recorded temperature increases over the past 20 years. Not only were the actual increases much lower, but they were lower than what Hansen expected if there were drastic cuts in CO2 emissions - which of course there haven't been. [Hansen is a noted scientist who was featured prominently in Al Gore's global warming documentary, "An Inconvenient Truth."] Hansen was at that hearing. Did he say anything to you afterwards? We really don't communicate. We serve on a committee for NASA together, but it only deals with specific satellite issues. At the Ways and Means hearing, he was sitting two people down from me, but he did not want to engage any of the evidence I presented. And that seems to be the preferred tactic of many in the alarmist camp. Rather than bring up these issues, they simply ignore them. I know you think there's been something of a hysteria in the media about melting glaciers. Could you explain? Ice melts. Glaciers are always calving. This is what ice does. If ice did not melt, we'd have an ice-covered planet. The fact is that the ice cover is growing in the southern hemisphere even as the ice cover is more or less shrinking in the northern hemisphere. As you and I are talking today, global sea ice coverage is about 400,000 square kilometers above the long-term average - which means that the surplus in the Antarctic is greater than the deficit in the Arctic. What about the better-safe-than-sorry argument? Even if there's a chance Gore and Hansen are wrong, shouldn't we still take action in order to protect ourselves from catastrophe, just in case they're right? The problem is that the solutions being offered don't provide any detectable relief from this so-called catastrophe. Congress is now discussing an 80% reduction in U.S. greenhouse emissions by 2050. That's basically the equivalent of building 1,000 new nuclear power plants all operating by 2020. Now I'm all in favor of nuclear energy, but that would affect the global temperature by only seven-hundredths of a degree by 2050 and fifteen hundredths by 2100. We wouldn't even notice it.